Do you ever find yourself wanting a quick yet healthier version of the boxed oatmeal from the store? This recipe has less sugar but is just as rich in flavor! Instant oatmeal is one of those breakfast household staples. Those little packets, usually 10 to a box, are very convenient for rushed mornings. I love making my own because they are cost effective, I can reduce the sugar, and I can customize to whatever I have on hand. If you have kids (especially big ones) who love instant oatmeal, you know they can go through two or three packets on one sitting! By Thursday, I am nearly out of oatmeal. This leads to making plain oatmeal from quick oats and adding a little milk and sugar on my own. When Laura, the Chief MOM, gave me her oatmeal packets recipe, I realized that I should have made my own all along! The ingredients are simple: quick oats, salt, brown sugar, cinnamon, and powdered milk. If you follow our recipe, you’ll be able to make up to 24 packets of instant oatmeal. That’s over twice the amount that comes in a single box! My daughter and I made them together, and I can say she really loved helping me make these. Nothing beats mother/daughter time! She loves oatmeal and was shocked to see how many packets we made in so little time! The best part is that we can add whatever she wants to it. I don’t need to buy separate boxes for different flavors! I can add my own mini chocolate chips or dinosaur sprinkles to it, and she likes it just the same! You’ll never need to go back to boxed instant oatmeal again once you realize how easy it is to make your own! 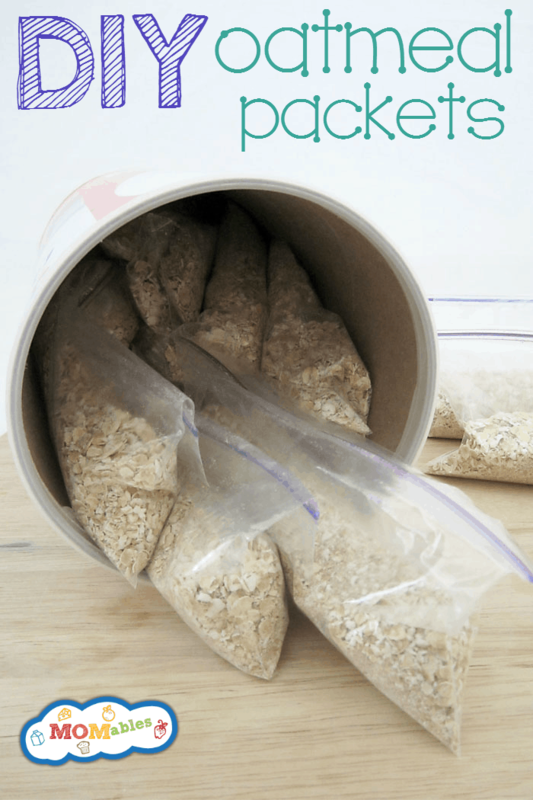 When making these DIY Instant Oatmeal packets, I put most of them back inside my quick oats container for storage, but any container will work. Put 6 cups of the oats into a large bowl. Place the remaining 4 cups of oats into a blender. Blend until almost powdery, then pour into the large bowl. Add the salt, brown sugar, powdered milk, and cinnamon into the large bowl. 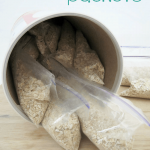 Measure 1/2 cup of the oatmeal mixture into each snack-size plastic baggie and seal. Pour the packet into a bowl, and add the desired hot water. Stir and serve. Because the plastic bag doesn’t get wet or dirty, you can reuse it. Great idea! I’m going to make the recipe and put in glass containers instead of baggies. My kids can add water, microwave it, and eat out of the jar-or take it on the go! a total step up!! love it. Love it. Any recipes gor banana instant oatmeal? Use dehydrated banana chips in each packet. That should do it! As a family of 5, we can easily eat 10 quaker oats packets for breakfast so i just put it all in a container with a scoop and they fill up their bowls with what they want and add hot water. No messing with plastic baggies. We take this camping alot, it is perfect for backcountry camping. Give it a shake before scooping, in case ingredients have settled out. Oats are perfect for camping! They sell powdered maple syrup on Amazon. Pricey, $20.85 a pound, couldn’t find anywhere how much to convert to liquid form, so don’t know how much to add to recipe. Used, per info, mainly for hiking, camping and cooking BBQ. Has anyone tried these with even less sugar? Like 1/2 C for the whole recipe? I put this recipe through myfitnesspal recipebox for the nutrition facts, and even at 1C of sugar, and 24 servings, each serving has more sugar than my quaker instant oats (apple cinnamon flavor). Although I’m stoked that I can identify all the ingredients, we try to limit our sugar at breakfast to less than 9g per serving (unless it’s whole fruit). Hi, Jo! You can definitely reduce the sugar to whatever you’re comfortable with. It won’t be as sweet, but you can top it with fresh fruit once you’ve cooked it to make up for the reduced sugar. Hope you enjoy it! Thank you for this. I did this, this morning before finding your site. The only exception I used Steel-rolled whole old fashioned oats. Just as tasty. I did no think of the powdered milk or brown sugar – should give that a try. I wonder if they make powdered maple syrup for the maple and brown sugar instant oatmeal – that and the raisins are my favorite. Hmm I’ve never heard of powdered maple syrup, but that would definitely be convenient for these packets. Thanks, Jason! Yes, they do make maple syrup powder. You can find it on amazon. It’s suppose to be better for you than sugar. Thank you so much for the inspiration. I had so much fun putting together these oatmeal packets. I have grown so tired of the store bought ones. I can’t wait to start experimenting with different flavor combinations! Has anyone tried any other flavor variations besides Apples & Cinnamon (love that one) and Strawberries and Cream (allergic to strawberries)? I would love to try more flavors, but I’m scared to ruin a whole batch by adding the wrong ingredients or messing something up. Jackie, I get the freeze dried fruit from Target. It doesn’t have added sugar and it’s a dry ingredient like the oats. When I make the bags I just put a spoonful in each. Hope that helps. This us wonderful than you fir sharing. My almost 4 year old and will be putting these together today! Now, how about a similar recipe for those Cream if Wheat packages?? ;). Those are his absolute favorite and with twin brothers in his heals I can see a lot of consuming of them! And it sure would save me some money ! Thank you for your great ideas, making the mom world that much easier for us! Has anyone tried substituting the milk powder with whey protein powder instead? Can I use powdered soya milk, I have not seen powdered cow’s milk on the shelf in my island in many years. Absolutely. You can also omit and use your preferred milk when cooking instead of water. Has anyone tried a substitution for powdered milk that gave the creamy constancy? Example; powdered coffee creamer. Powdered milk has a processed taste. Or does the other ingredients override that taste and replace it with creamy? Specifically looking to replicate the the strawberry and cream taste. you can omit powdered milk and use milk to warm it up instead of water. use freeze dried strawberries. I would use almond milk after cooking it. YES! You absolutely can use powdered creamer! A recipe I had called specifically for that, but because of all the chemicals, I went half and half. I’m dairy free, so I added 1 teaspoon xanthan gum to my recipe to replace the milk powder, and it turned out great! Any ideas on how to add a maple flavour? My daughter loves the instant maple/brown sugar oatmeal. when you heat them up add maple. they don’t sell crystalized maple -unfortunately. It shows a couple of ways to make your own crystal maple syrup. It actually sounds like fun!! Maybe use Granulated Maple Sugar? after cooking i throw in some maple syrup. It is YUMMY! For those with milk problems, you can also add powdered nondairy creamer. I have no powdered milk on hand, but I would rather use whole milk since my toddler really like oatmeal. Can I omit the powdered stuff and just add the milk when making it? I like the fruit and cream type oatmeal. Does all the fruit need to be freeze dried? And where do you get freeze dried fruit? yes, you would use the freeze dried fruits. Many health grocery stores (like whole foods) and online websites (like Amazon) sell them. Freeze-dried fruit can be found at Target, Trader Joes, and even possibly your local grocery chain. Look for it in the same place they sell dehydrated fruit, raisins, and prunes. I’m sure with small children there would be no problem with using this up quickly. Was just wondering what the shelf life would be otherwise, thanks. 2-3 months? It will depends based on the expiration date of your ingredients. Thank you!! I have Celiac’s and can no longer eat the pre made type. I can’t wait to try this. I’m have everything on hand except the powdered milk. I will pick that up tonight. So awesome Dawn! Glad this is helpful for you. I’m a celiac and have to eat gluten free. I have an extremely hard finding quick cook oats. How does one go about making quick cook oats out of regular gluten free rolled oats? Place rolled oats into the food processor and pulse 4-5 times until they are coarsely chopped but not powdery. By cutting up the rolled oats, you make them faster to cook and very similar to store-bought quick oats. You only need a few pulses, otherwise the oats will turn to mush when they’re cooked (like those instant oats packets). Instead of keeping two different containers around, just buy rolled oats and turn them into quick oats whenever you need them. Would like to try 1 serving how can I make one to try. Can I use this recipe for vacuum sealing for long term use? Has anyone tried almond flour instead of dry milk? We have dairy allergies and I’m wondering if that would work…LOVE the idea of using the Keurig machine for the water too. Thanks! Jenn, you can leave the dry milk out or use powdered goat milk if you can tolerate it. using almond flour will thicken it but does not serve the same purpose. I’m going to try with powdered rice milk since we are also allergic to dairy. Fingers crossed it tastes good! Brooke, I’ve done that too! It works out perfectly! We have purchased the pre packaged oatmeal in the past and I love the idea of making my own, but I was curious if the dry milk has to be included with the recipe above if we usually just use water to make the pre packaged oatmeal? Is there any significance for the dry milk to be included? Thanks! Kristi – you can omit the dry milk. However, it gives it a delicious creamy consistency. Awesome! I can’t wait to make these without the dry milk since it’s adds extra calories that we are trying to omit from our diet at this time. Thank you so much for sharing this recipe!! let me know how your family loves them! You could also save yourself some time and plastic bags and just have the mix in a large container and use a measuring cup to put in the bowls. That way you can also alter portion size depending on the appetite. We started doing that too! I have rolled oats in my pantry. Are they the same? Can I use them? Rhonda, rolled oats are not quick oats. those take longer to cook. Hi! My kids love the apples & cinnamon instant oatmeal. Any suggestions? Thanks! add 1/2 cup chopped dried apples to the mix, then distribute evenly among bags. Can you give me an idea on the amount of boiling water? And the amount of time to let it sit? Sharee, the amount of boiling water is really up to your preference on how you like your oatmeal. You could try starting with 1/2 cup of water and adding more if you want more. I usually add a little at a time until I reach the consistency I want. I let the oatmeal cool for a about 2 minutes before eating. Can you omit the powdered milk and just make it with milk? Just wanted to let you know that we made these this weekend. We omitted the milk and just made ours with milk and they were fabulous. I’m sure readers who use alternative milks will love that. You have just saved me a TON of money. My kids eat oatmeal 3-5 times a week. Now I can make their favorite, make it organic and make it in larger portions (3/4 cup) and not break the bank. They ate 4 “packets” before we could get them all bagged! I’m so glad this helped your family Jessica!! Thank you for letting others know that it was a hit with your family and that It will save you money! Have you found a recipe to make these the “creamy” versions they have in the store (strawberries and cream) for example, my son loves the oatmeal this way but my daughter only wants the strawberry and cream version which I don’t buy from the store anymore, I have yet to figure out how I would concoct this version at home, if you have any ideas, I would greatly appreciate it! For the strawberries and cream, omit the cinnamon, add 1/4 cup more powder milk and add 1/2 cup crushed freeze dried strawberries. You can absolutely do that!